We don't think of Project Row Houses as a site for formalism. We don't imagine that artists are going into these small reclaimed houses and using them to investigate the plastic visual qualities inherent in the medium. We aren't accustomed to thinking about installations in those terms at all (although certainly minimalists did so in their own fashion), but more importantly, we aren't used to thinking about Project Row Houses that way. The project as a whole is explicitly about community engagement, and many of the projects are political or polemical, or have social practice dimensions (for example, John Plueker's Antena Books: Pop-Up Bookstore and Literary Experimentation Lab or Darin Forehand's Printproject). Nonetheless, when an artist is given a row house for an installation, it has certain formal qualities as an architectural space, and all the artists use this to a certain extent. In Vines and Leaves by Jürgen Tarrasch and Salt House at Sean Shim-Boyle, formal effects dominate. The houses are small boxes--a single room with windows on all walls and doors at either end and a column--the brick chimney--in the center. But they aren't all the same. The house used for Vines and Leaves has a flat ceiling while the one used for Salt House has a vaulted ceiling with dark brown wooden cross-beams. I'm not sure if these are permanent or if the artists specified them for their respective works. In either case, the type of ceiling is important for the work each artist did. Tarrasch has painted the entire interior of his project various bright, intense glossy shades of green. On a sunny afternoon, with light pouring in, you end up with green reflected light bouncing around inside the boxy shape. The pattern of light coming in through the window and crawling across the speckled green walls is part of the piece, a use of the inherent qualities of the structure for a dazzling visual effect. The yellow and green "speckles" are short staccato brush-strokes which could be seen as leaves being caught by sunlight. Up close, they look a little like Howard Hodgkin's brush-strokes. And like Hodgkin, Tarrasch is depicting something real (leaves and vines) through almost total abstraction. The low ceiling is important for a couple of reasons. One is that as light enters the windows and doors, Tarrasch has made sure that it doesn't have to go far to be reflected. You are inclosed by a confining green, both in terms of local color and reflected color. Green photons are bouncing around all over Vines and Leaves, pouring onto your retina. The work is fundamentally retinal. Tarrasch is using the interior of the row house in a way no different from the way a painter uses a canvas, as a surface or support for the painterly visual effect he hopes to achieve. And it works. This is not to say that there are not other meanings and possible interpretations embedded in the work. It would be impossible to imagine otherwise. I've never believed Frank Stella's dictum "What you see is what you see." On the contrary, I feel that what Borges wrote in the introduction to Doctor Brodie's Report applies as well to visual art as to literature: "There is not a simple page, a simple word, on earth--for all pages, all words, predicate the universe, whose most notorious attribute is its complexity." But for this post, it is the formal visual qualities that concern us. Rather than taking the row house as a surface for paint, Sean Shim-Boyle uses the inherent qualities of the house as formal elements. Salt House's row house has a vaulted ceiling with cross-beams. The ceiling and walls are white, the floor grey, and the crossbeams a stained wood-color. The brick chimney in the center of the house is left uncovered, and because of the vaulted ceiling, it seems especially tall. The windows and doors let light pour in. Shim-Boyle has done two seemingly simple additions. The most prominent is that he has added a second chimney, slanted at a shallow angle extending from a rear corner to near the front of the house. This second chimney is astonishingly realistic--it looks and feels like brick and mortar. The second element is a long thin hole in the floor into which are set bright fluorescent lights, creating, as it were, a new "window" for allowing light into the house. What made me think of formalism when I saw this house was the diagonal of both the second chimney and the hole in the floor. When I see an element perpendicular to the ground next to a leaning element, I think of sculpture, specifically the geometric metal sculpture of artists like Mark di Suvero. We have here a sculptural form, one which uses the material of the setting and the elements of the setting. Even the angles of the light and chimney can be said to be reflecting the angles of the vaulted ceiling. And the play of light and dark (chimneys and beams against the white painted walls) gives the viewer the feeling of being within a geometric abstract painting. Both Salt House and Vines and Leaves depend on visual fascination and--dare I say it?--beauty. Most artists who do installations in a PRH row house rely on the structures' humble grunginess and mutability as a ground for the work, and they are perfect for that. But Shim-Boyle and Tarrasch are operating under the assumption that these places are beautiful and that their installations should reflect that. In this regard, they go back to one of the original inspirations for Project Row Houses. When PRH founder Rick Lowe first saw these row houses on a bus tour sponsored by SHAPE, where they were held up as dangerous places, blighted houses that needed to be torn down and replaced. 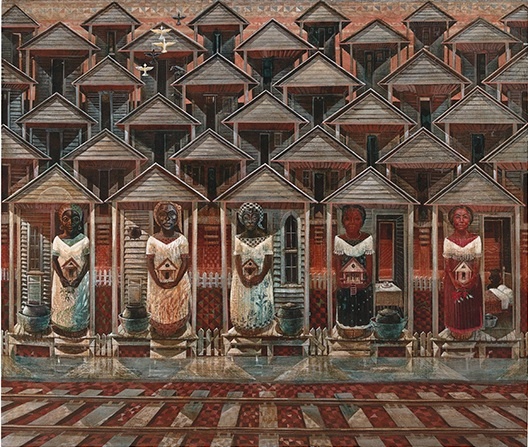 But they made Lowe think of certain paintings by John Biggers of this kind of house, and they inspired him to think of preserving them instead of tearing them down. (See What We Made: Conversations on Art and Social Cooperation by Tom Finkelpearl for Lowe's first-hand account of this.) Biggers's paintings find a kind of geometric beauty in the houses--a beauty that Tarrasch and Shim-Boyle have rediscovered.